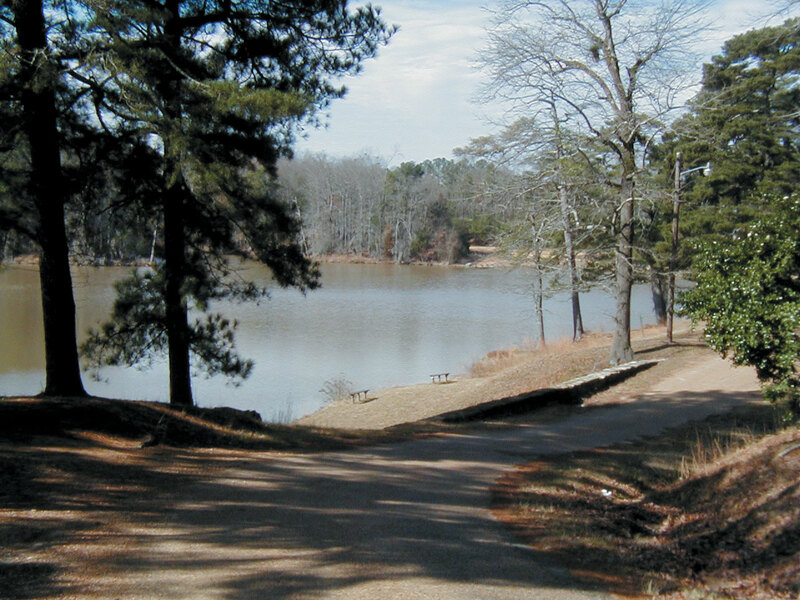 When I was a child, my parents would stop with us at Chautauqua Park in Crystal Springs, Mississippi, for a brief rest each time we drove on Highway 51 coming back from our frequent visits to family in McComb, located 16 miles north of the Mississippi-Louisiana state line. Those were the days before Interstate 55 was built, when we shared the narrow two-lane highway with logging and gravel trucks, making an already long drive seem much longer. This view across the lake is but a small indication of the serenity one can find walking around the park. Many years later, I decided to stop once again at the park with my family. What I had remembered as just another place to escape the confines of my parents' Rambler station wagon and run off my nervous energy was revealed to me to be a lovely oasis just a short drive south of Jackson. Much has changed at Chautauqua Park since I was a child, yet I still experienced a strong sense of stepping back in time. Passing through the entrance and following the stone-lined drive beyond the caretaker�s cottage, I arrive at the covered pavilion that sheltered many a rainy-day picnic. Sitting quietly and listening to the wind in the trees and the geese on the lake, I could almost hear my mother call from the car to continue the drive home. As I stand up and walk across the grass to the lake, I look around and realize that there is indeed more to this outdoor treasure than is immediately apparent. 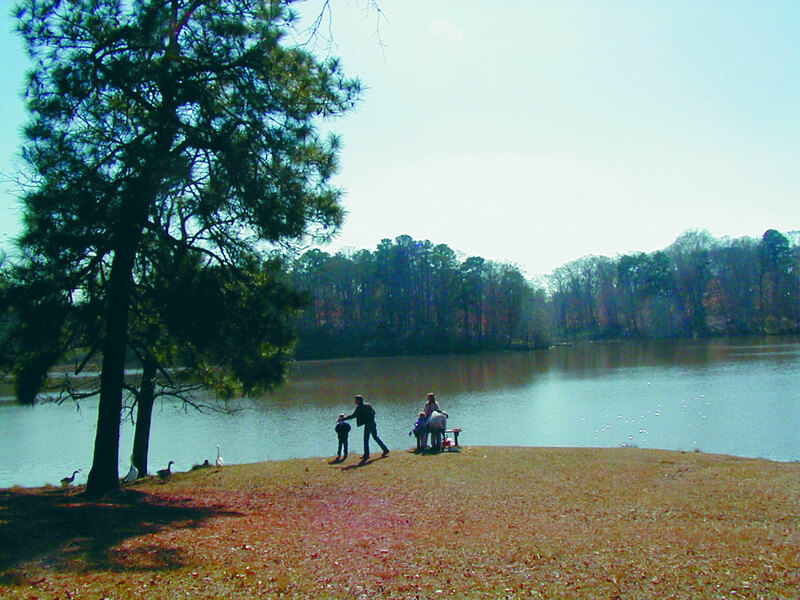 A family from Clinton, Mississippi, enjoys their outing at the lake in spite of the noisy geese seeking handouts. Lake Chautauqua is not a natural lake. It is wholly man-made, its location chosen in the late 19th century because the area is the highest elevation between Memphis and New Orleans. It was constructed for the purpose of watering the steam locomotives that stopped in Crystal Springs in order to load the locally-grown produce for shipment around the country. Supervised by Captain Frederick Y. Dabney, who also designed the lake, work began in 1895 with man- and mule-power to move the earth and build the dam. It was completed in 1897 with the addition of two large diesel-powered pumps to carry the water the little more than a half-mile east through a wooden pipe to an elevated tank next to the railroad. The town of Crystal Springs was originally settled in 1823 several miles west of its present location. The citizens decided to move in the mid-1800s so as to be close to the railroad line that was coming through the area. 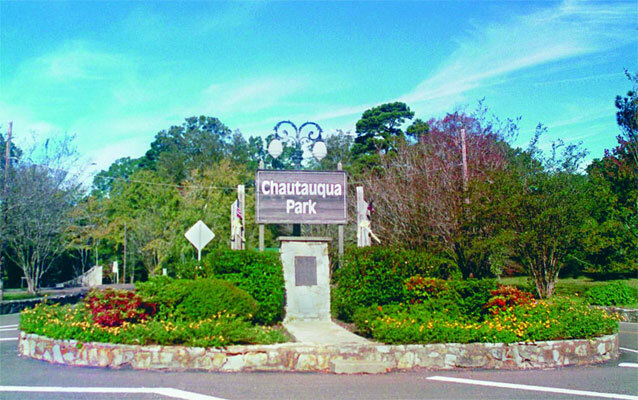 Chautauqua Park was created at the lake toward the turn of the century as part of a nationwide drive to bring entertainment and enlightenment to the country. The Crystal Springs Assembly of the Chautauqua Movement was most likely the best known in Mississippi, resulting in what amounted to a small community springing up around the lake, including �88 cottages encircling a tabernacle, a 40-room hotel, restaurant, and grocery� as noted in Crystal Springs, Mississippi: A Brief History that once appeared on the Mississippi State University website. 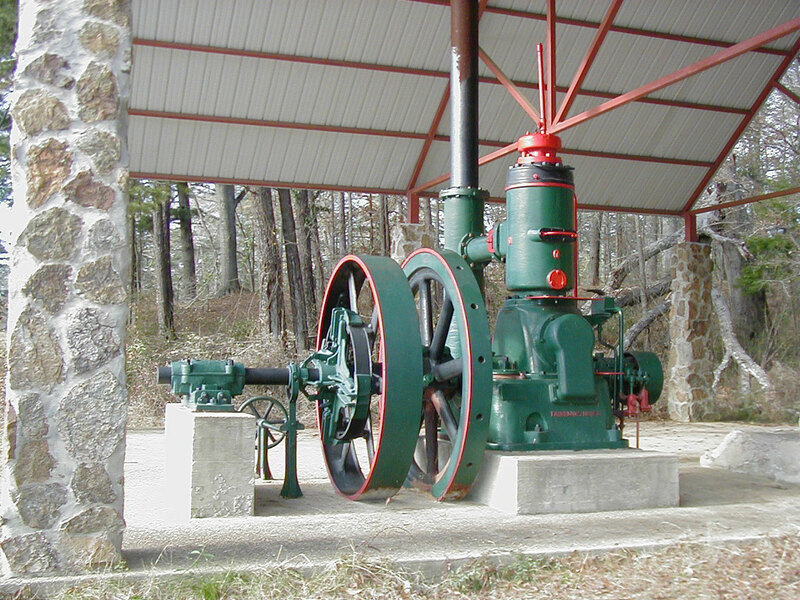 The pavilion for the steam pump next to the lake was built in 1996. The hotel has since burned, and what remained was taken apart. Some of this material was used to build a house for a local antiques dealer. The cottages have also been removed from the grounds and now serve other purposes in the area. Present day visitors can relax in the peaceful settings lakeside or wander the park�s trails, where station markers and informational kiosks broaden one�s understanding of the ecosystem. A special treat for the hiker is the Trail of Tranquility, a stroll through the northern end of the park where your footsteps are muffled by a thick layer of shredded tree material. 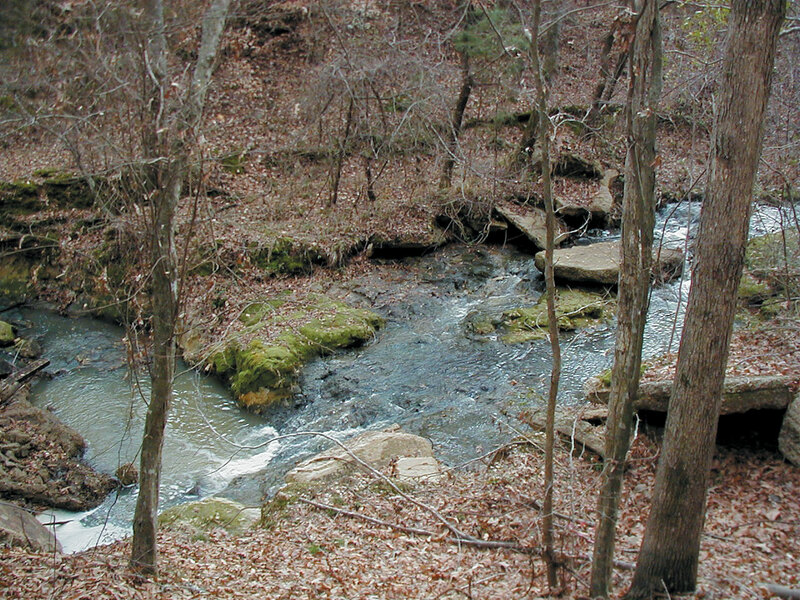 This trail leads down hill to a small stream that runs along the northern edge of the park. 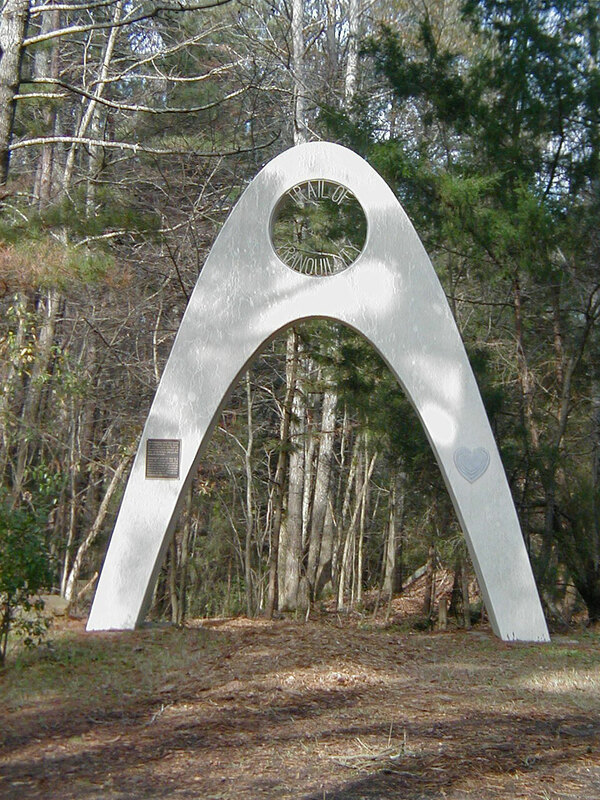 The arch marking the Trail of Tranquility (left) can be found off to the right of the main entrance to the park. A stroll along the Tree Top Trail (right) gives one a unique perspective on the woods north of the lake. 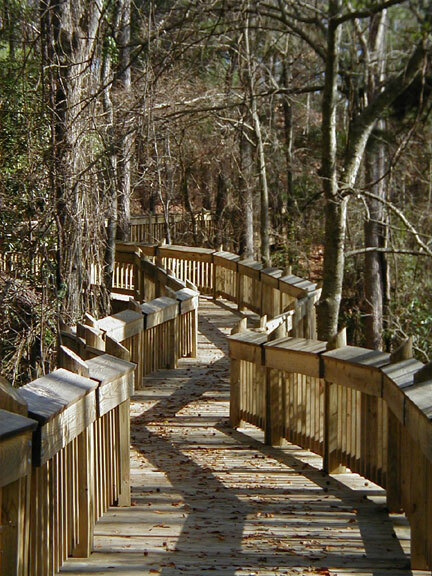 And for a tree-level view, try the Tree Top Trail, 1,500 feet of elevated walkway winding through the trees and across the overflow stream from the lake. This walkway connects leads you to the Chautauqua Spring House (shown below) that was constructed to shelter the clear spring that supplied drinking water to the Chautauqua Hotel and campground in the early 1900s. 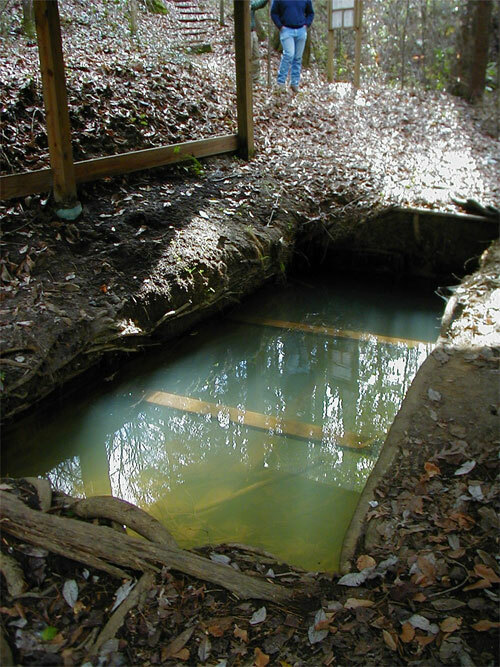 Although cloudy and undrinkable, the once crystal clear water from this and other springs in the area gave the town of Crystal Springs its name. Both past and present are clearly evident here at Lake Chautauqua. 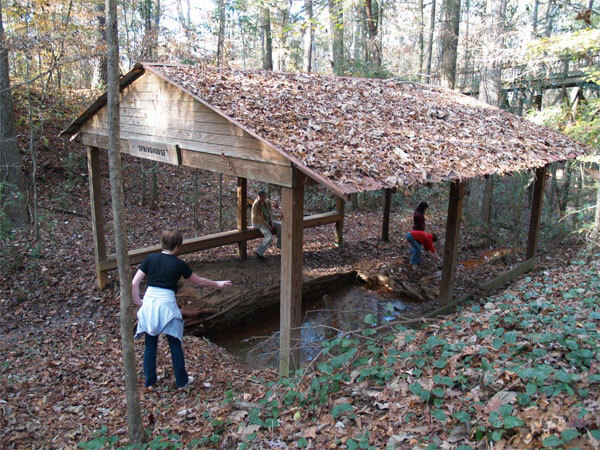 Close to the shore is a pavilion that was constructed in 1996 by the local campus of ResCare�s Mississippi Job Corp Center to shelter the one remaining water pump. 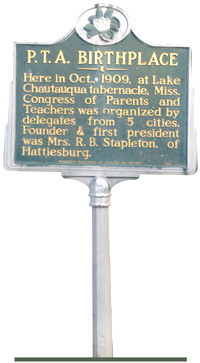 And as noted on the historical marker (left) next to the pavilion across from the caretaker�s cottage, the Mississippi Congress of Parents and Teachers got its start here in 1909. The dam, originally constructed of concrete, failed catastrophically during the night in the mid 1970s, completely draining the lake and leaving large pieces of the structure downstream from the present day earthen dam. These pieces can be seen from the Tree Top Trail, looking today as much a part of the stream as the moss-covered boulders placed there by nature. Some adults who visit the park today have memories of their balancing act in crossing the narrow top of the old concrete dam. And as to the future of the park, since all funds for construction are donated, change will be slow but well-thought out. More trails are planned to add to the visitor�s enjoyment but one fact can be guaranteed: a visit today, or a visit 10 years from now, will certainly be satisfying, as Lake Chautauqua is indeed an outdoor treasure, and a rare one at that. Located a half-hour�s drive down Interstate 55 south of Jackson in Crystal Springs. Take exit 72, drive east to Highway 51, then right to the park�s entrance about one mile on your right. The park is open from dawn to dusk. As always, when spending any time outdoors in Mississippi, dress accordingly depending on the weather and season, use insect repellant when needed, and during the summer heat and humidity, drink plenty of water.